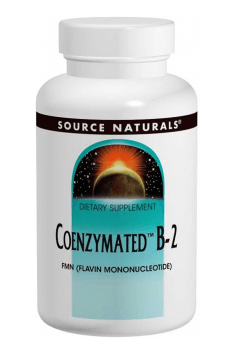 Source Natural Coenzymated B-2 is a dietary supplement which contains an optimal dose of vitamin B2 in the form of flavin mononucleotide (FMN). It is a biologically active form of vitamin B2 which does not need to undergo conversion. After entering the body, it fulfils instantly its functions. The formula has a form of convenient sublingual tablets. Such administration method ensures maximum absorption and bioavailability of the active substance. The formula is recommended for correcting vitamin B2 levels and preventing potential deficiencies. Supplementation is indicated during increased demand for riboflavin, so in the period of intensive growth, pregnancy and lactation, prolonged stress or excessive physical activity. Adequate riboflavin supply should be provided by seniors and individuals on low-calorie diets. Vitamin B2 (riboflavin) is necessary for healthy functioning of the body and is involved in all key biochemical reaction. Their best source is almonds, brewers' yeast, meat, eggs, milk and its products, legume and wholemeal products. Large amounts of riboflavin from food are lost due to exposure to light and during processing. While it is not destroyed by heat, it is lost in water, e.g. during cooking. In order to be utilised by the body, riboflavin must be converted into its active forms which is flavin mononucleotide (FMN) and flavin adenine dinucleotide (FAD). Its metabolism is regulated, among other things, by pancreatic hormones. Riboflavin is essential to maintaining proper energy levels. It is responsible for the metabolism of nutrients (proteins, fats and carbohydrates), catalysing the oxidation of glucose, amino acids and fatty acids. It takes part in the metabolic pathway called oxidative phosphorylation, namely energy production during respiration. Riboflavin deficiencies can be manifested by the lack of vitality and fatigue. Riboflavin acts as a antioxidant and effectively protects cells from harmful effects of free radicals. Its phosphate form (FMN and FAD) is a component of flavoprotein which are critical to proper redox reactions. What is more, adequate vitamin B2 intake is necessary for maintaining proper levels of glutathione that is the most significant endogenous antioxidant in the body. Numerous studies have confirmed the correlation between riboflavin deficiency and lowered glutathione levels. Studies have shown that riboflavin deficiency increases the incidence of some eye diseases, especially cataract and glaucoma. It is probably related to lowered glutathione concentration in the lens because too low riboflavin intake reduces the activity of the enzyme glutathione reductase, which underlies the conversion of glutathione into its reduced form. Glutathione deficiencies contribute to losing protection from harmful effects of free radicals and consequently damaging structures of the eye. Adequate vitamin B2 intake results in normal haemoglobin levels and is necessary for preventing anaemia. Riboflavin has a vital role in erythropoiesis (the process of red blood cell proliferation and differentation), improves the absorption and utilisation of iron, as well as increases the activity of ferritin. Riboflavin improves the condition of the cardiovascular system. It is necessary for maintaining healthy levels of homocysteine which has a negative impact on the circulatory system, damages blood vessels, leads to atherosclerosis and increases the risk of stroke and heart attack. The regulation of homocysteine levels is carried out in two ways and consists in the conversion of homocysteine into cysteine or methionine in the transsulfuration and remethylation pathway. Both processes depend directly or indirectly from the presence of riboflavin. Riboflavin has a vital role in maintaining healthy collagen functions and improves thus the structure of the hair and skin. It prevents the formation of fine wrinkles, speeds up wound healing and strengthens the hair. Vitamin B2 deficiencies are often manifested by skin inflammation, seborrhoea, cracked corners of lips. Riboflavin has a painkilling effect and is a proven cure for migraine. It has been demonstrated in many studies that it does not only reduce pain but also eliminates other migraine-related symptoms (nausea, oversensitivity to light), shortens its duration and decreases the incidence of migraine attacks. It can be also used to relieve pain associated with carpal tunnel syndrome. Like other important substances in the body, two metabolically active forms of riboflavin (FAD and FMN) must be metabolised before they fulfil its role in the body. Vitamin B2 is critical to conversion of retinol into retinoic acid, takes part in the activation of pyridoxine and folic acid as well as conversion of alpha amino acids into ketoacids. It is necessary for the synthesis of vitamin B12. Riboflavin is used by kynurenine hydroxylase – the enzyme responsible for the conversion of tryptophan into vitamin B3. To sum up, Coenzymated B-2 is a perfect element of preventing riboflavin deficiencies. It contains a standardised dose of coenzymated vitamin B2 which ensures fast and effective action. Excess vitamin B2 is excreted quickly through the urine. It is therefore quite difficult to overdose it. Take 1 tablet daily. Place tablet under the tongue and allow it dissolve. Change the position of the tablet to avoid prolonged contact with the same area of mucosa. Vitamin B2 in the biologically pure, coenzymated form. The formula has a form of convenient sublingual tablets. As a preventive measure, take just 1 tablet daily. Place tablet under the tongue and allow it dissolve. Change the position of the tablet several times. Vitamin B2 is water-soluble and that is why it does not have to be taken with food. Riboflavin may colour the urine bright yellow. It is a normal phenomenon associated with excreting excess riboflavin which does not risk your health in any way. sorbitol, mannitol, natural peppermint flavor, and magnesium stearate. Ultra Mag uses a complex blend of highly bioactive forms of magnesium. Herbal complex for supporting woman through the hormonal transitions of menopause.